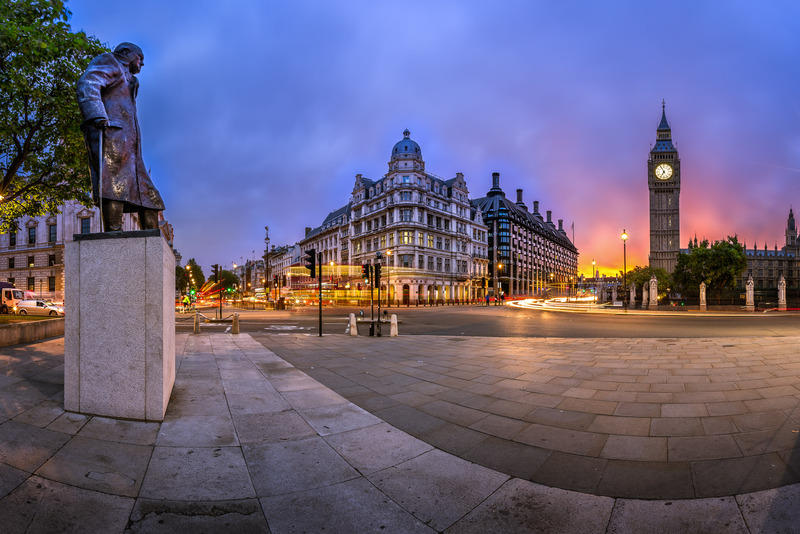 This photo captures a sculpture of Winston Churchill in this famous spot in London. Many do not know he was actually almost maimed and killed in New York in 1931. October 2014, panorama from 3 vertical images, additional exposures for highlights, focal length 16mm, aperture f/11, exposure 6 seconds, ISO 160, tripod. When crossing the road in the United States during a late night visit to a friend, Bernard Baruch, he instinctively looked to the right when he went to cross the road. Vehicles drive on the opposite sides of the road in America and Britian, so this slip almost proved fatal. A car hit Churchill dragging him for a short distance. He escaped with relatively minor injuries. He admitted that the accident was completely his fault, not that of the driver. The world definitely would have been a different place without the leadership of Churchill past 1931. To capture this photo I needed to hurry. I had just captured the Lloyd George statue in the previous photo then I darted over here to get one of Winston Churchill. Often when people see the serene pictures photographers capture, they think “what leisurely hobby photography must be”. The truth is the changing light is constantly keeping you on your toes to get the best photo in a limited time frame. It can actually be quite suspenseful! When I set out to capture Winston Churchill I knew I wanted the Clock Tower included in the composition to give the viewer a sense of place. To me this perspective gives the impression that Churchill is skeptically watching over the Clock Tower and Parliament and maybe his spirit is still keeping an eye on what is going on in the United Kingdom.